Location: Okanagan Lake, home of the legendary lake monster Ogopogo, is the largest lake in the region and located close to the centre of British Columbia's beautiful Okanagan Valley. BC Highway 97 takes you along the shoreline from Penticton to Kelowna, travelling through many communities. Along the way there are numerous access spots leading to beautiful sandy beaches, resorts and campsites. The Kelowna Floating Bridge heads to the city of Kelowna and Highway 97 continues north, but no longer follows the lakeshore. The scenic Westside Road, just north of Westbank, now takes you along the westside of the lake and joins Highway 97 northwest of Vernon. 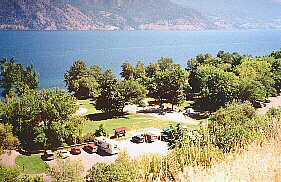 Resorts & Campsites: Penticton, Naramata, Summerland, Peachland, and Kelowna are all located on the shores of Okanagan Lake catering to the thousands of visitors to the area every year. Provincial Parks, private campsites and resorts can be found up and down along the lake. For the fisherman and boaters there are numerous bays and coves that offer good moorage. The sandy beaches invite beachcombers, hikers, sunbathers and swimmers, while the bright blue waters draw water skiers and wind surfers. 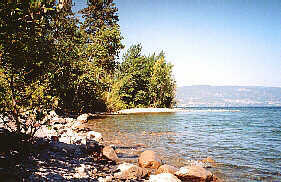 Okanagan Lake is an excellent family fun location.